HomePalmistryWhat Do Your Fingerprints Mean in Palmistry? Are You A Simple Arch, Sociable Loop or Complex Whorl? As a professional psychic and palmreader in Brisbane, I love sharing the secrets of palmistry with others. This article is for those of you who’d like to know more about the meaning of fingerprints. 2017 Update – due to a website upgrade, pictures will be re-added to this blog post as time permits. Thanks for your patience. For me, palmistry is a cult passion and I love having my hands read. That’s why I was delighted to swap sessions recently with Jena Griffiths, a hand analyst from Switzerland, who’s trained with the International Institute of Hand Analysis (IIHA). Jena runs Earth School, which features interviews with spiritual teachers such as Byron Katie. 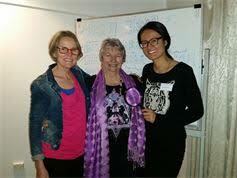 That’s Jena to the left of the photo, taken at her recent workshop at The Relaxation Centre of Queensland. Patti Barton is in the middle. I was impressed by Jena’s spot-on analysis of my life purpose as an Innovative Healer. This matches my 29/11 Lifepath in numerology, which I call the Spiritual Messenger or Healer of Relationships. She was equally pleased when I pinpointed her as a 30/3 Lifepath in numerology, i.e. an Artist and Communicator, as this is what her fingerprints say about her. Find your lifepath here. It’s amazing how your palmistry and numerology complement each other. That’s why I use both modalities in my psychic readings, as a cross-check for accuracy. The scientist part of me still loves to get the facts right! Disclaimer: Please note that the information below is based on my palmistry approach and experience and does not reflect Jena Griffiths’ or the IIHA’s approach to hand analysis. 1) There are a few schools of thought on fingerprints in palmistry. Jena uses Richard Unger’s Lifeprints system, which analyses your fingerprints to reveal your life purpose. My method overlaps with this system, but also relies on traditional palmistry interpretation and personal experience. I find Lifeprints a useful reference book, which is most suitable for intermediate students of palmistry. It is full of interesting examples and detailed analyses. 2) Palmreaders like myself study your fingerprints AND the fingers they occur on. For example, the thumb represents you as a whole, your forefinger (Jupiter) shows your authority and ambition, your middle finger (Saturn) reveals your ethics and discipline, your ring finger (Apollo) reflects your love of the spotlight and creativity, and your pinky finger (Mercury) gives away your communication style and intuition. Fingers on your writing hand show your outer self, while fingers on your non-writing hand suggest your inner self (discussed further down). 3) Always check your fingerprints under bright light. I find it easy to see fingerprints, but most people need an illuminated magnifying glass or to make a handprint. You can use water-based black block printing ink, A4 paper and a hand roller for this, if you don’t have a proper inking sheet. Lipstick can also be used. 4) Pay attention to your thumbprint, as this forms the basis of your personality. The thumb on your writing hand reflects your conscious, adult, outward self. The thumb on your non-writing hand is your subconscious, child or past life self (i.e. it reveals inherited characteristics and your traits at home/ under pressure). Read more about Palmistry Basics. Although the lines on your hands change, your fingerprints don’t, which is why they’re thought to reveal your purpose in this lifetime. Fingerprints can be divided into Arches (including Tented Arches), Loops and Whorls (including Composite Whorls and Peacock Eye Whorls). In some cases, fingerprints can be half Arch, half Loop etc, which can be confusing unless you see or learn from an expert. You may find fingerprints that are hard to categorise. I see them on people with unusual numerology and/ or alternative belief systems. In some cases, these people seem a little ‘alien’ and/ or are aware they are genetically different to others. Pros: Practical, hands on, nature-loving, stoical and resilient. Cons: Represses emotions, can be rigid or sceptical. Resist change. Arches may appear on fingers where you have karma to process. I have an arch on my left forefinger (Jupiter), which suggests I tend to ignore my passions and ‘leak’ power. I’ve managed this issue by building a passion-based business, studying Holistic Counselling and having mentoring and therapy. Pros: Enthusiastic, dynamic, inspirational (often musical) and intuitive risktakers. Cons: Needs to find and follow passion or may appear directionless. Intensity. Loop – looks like a lasso or U-turn. You can have ulnar loops (most common – loop opens to the little finger side) or radial loops (rare, loop opens to the thumb side). Photo note: RH means ‘right hand’. I’ve flipped the print for an ulnar/ radial loop, hopefully you get the idea. Pros of ulnar loops: Flexible, creative, sociable, generous and cooperative. As the most ‘popular’ and common print, they appear on ‘likeable’ people. Cons of ulnar loops: Scattered, over-sacrificing, people-pleasing or restless. Pros of radial loops: Open-minded, unique perspective, clever and altruistic. Cons of radial loops: Empathic, need to stay centred or they absorb stress. Root Palmistry has an interesting take on Radial Loops. I don’t see them often, but when I do, I suspect the person is highly influenced by their spouse/ inner circle (if on their non-writing hand) or colleagues/ boss (if on their writing hand). Pros: Independent, unique, self-made, pioneering and capable. Cons: Secretive, keep worries in (affecting their heart). People confide in them, so they need outlets such as writing, music, counselling etc. Otherwise they feel like an island. Miten (from Deva Premal) has whorls on his thumbs, denoting wisdom. See his numerology reading. Pros: Psychic (especially with training), can see pros and cons, suited to justice/ healing work and charismatic. Suited to life in the public eye. Can juggle more than one job at a time. Cons: Indecisive (if they haven’t developed self-trust, e.g. through meditation). They need to learn persistence and thrive in progressive communities and natural settings. May be late bloomers. Complex nature. Cons: Occasionally prone to daydreaming. No cons are listed in textbooks – it’s a lucky sign. I hope you’ve enjoyed this whistle-stop tour of fingerprint meanings in palmistry! Want to know more? Please browse my palmistry articles and readings for famous people. Here’s a comical look at the fingerprints I wrote back in 2012. If you are serious about learning palmistry, it’s vital to research different handreaders and test their methods for yourself. Apart from Jena Griffiths, I am a fan of palmists such as Paul Fenton-Smith in Sydney, Lori Reid, Jennifer Hirsch and Johnny Fincham – see his take on dermatoglyphics (fingerprints). Handresearch.com also has a library of fingerprint articles and information. My friend (and fellow Master 11 lifepath) Patti Barton from the Gold Coast has also released a book called Patti’s Palmistry, which is available on Amazon as of March 2015. Patti is in the middle of the photo at the top of this page. If you liked this post, please join my facebook page The Numbers Queen. You’re welcome to post on the timeline.